There will never be any replicating of Doug Harvey. One should be very cautious even about drawing comparisons between the legendary defenseman and other players since his time. Bobby Orr certainly revolutionized the defense position. Paul Coffey rewrote the majority of the offensive records for D-men. Nicklas Lidstrom defined the 1990s and 2000s as the best blueliner of his particular era and then some. But no defender – argue if you will – embodied the definition of the position than what Harvey did. He sculpted the game before Orr did, was the original “offensive defenseman”, and shall forever be the consummate blueliner. Ability to generate offense – check. Creating plays and headmanning the puck – check. Quarterbacking the point and running the power play – check. Powerful skating and deceptiveness – check. Longevity to its utmost – check. Relevance in three different decades of NHL hockey – check. A perennial champion and award recipient numerous times – check. The leadership skills of a general or an admiral in the military – check. Harvey possessed all of these characteristics and then some. The aforementioned players had most of these, but Douglas Norman Harvey had it first, in abundance and better than the rest. The wonderful thing about the true greats of the game of hockey – the real legends – is that even in the twilight of their careers, they are still a factor. Players such as these become difference makers and example setters for their hockey clubs. When they speak, you listen. The knowledge that they can impart to younger players has no price that can be attributed to it, for it goes beyond any measurable value. This wisdom comes across verbally in spoken guidance and direction, bodily in terms of positioning and situational play on the ice, and behaviorally with how a player carries themselves both on and off the ice. 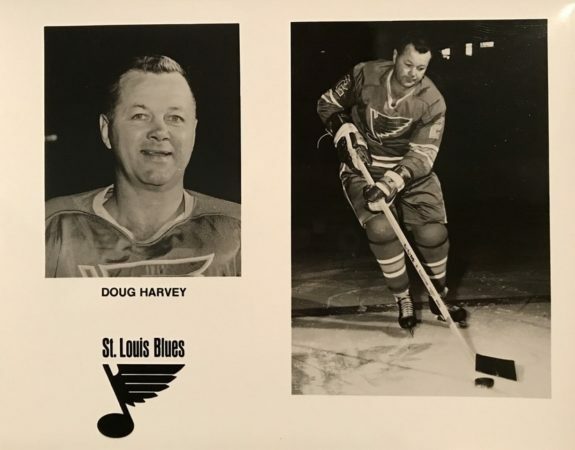 Doug Harvey was the prototypical living legend in his early 40s, and what he brought to the St. Louis Blues was invaluable. This is what makes his 1968-69 NHL season with the St. Louis – the final one of his career – a one for the ages year that must not be forgotten. It is difficult to do proper justice to Harvey’s achievements in hockey before his time with the Blues. In all actuality, his accomplishments speak for themselves. In the “Original Six” era of the NHL, Harvey was hands down the best defenseman in the world. Although there were plenty of great defensemen throughout the 1950s and 1960s – many of them eventual Hall of Famers – no one was quite as good as he was. Harvey’s first taste of the NHL came during the 1947-48 season which he split between the Montreal Canadiens and the American Hockey League’s Buffalo Bisons. Playing in 35 games for Montreal that year he generated four goals and four assists from the back end. Harvey would end up playing the next 15 years in the NHL without any return to the minors. 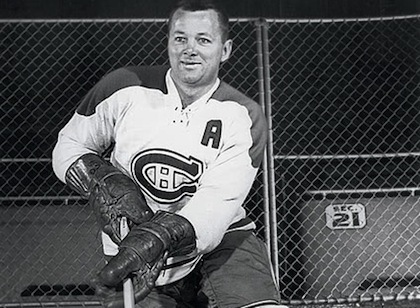 Doug Harvey won six Stanley Cups with the Montreal Canadiens, including five in a row from 1956 to 1960. From that first 1947-48 season up through the 1960-61 campaign, he played 890 games for the Canadiens. While with Montreal he scored 76 goals and 371 assists for 447 points. More importantly, Harvey’s incredible decision-making, flawless positioning, and ability to run Montreal’s devastating power play would see the accolades come pouring in. He would receive the James Norris Memorial Trophy as the NHL’s best defenseman in 1955, 1956, 1957, 1958, 1960, and 1961 all while with the Canadiens. Harvey played in every NHL All-Star game from 1951 through 1961 during his Montreal tenure. He was named a First Team All-Star from 1952 through 1958, and then again in 1960 and 1961. Harvey was a Second Team All-Star in 1959. Most importantly though, during his time with Montreal Harvey was instrumental in bringing six Stanley Cups to the storied franchise. First in 1953, and then five straight Cups from 1956 through 1960. Whether Harvey never continued to play beyond his years with the Canadiens, or even if the St. Louis Blues ever existed or not, he would have been guaranteed a spot in the Hockey Hall of Fame regardless. Doug Harvey would a total of seven James Norris Memorial Trophy’s as the NHL’s best defender – six as a Montreal Canadien, and one as a New York Ranger. Aside from so many wonderful achievements, it is saddening to consider that throughout Harvey’s career he battled more than his fair share of demons. This day in age, he would have received the support and help that he needed. For many years he struggled with alcoholism and bipolar disorder. Despite his greatness on the ice, Harvey made enemies with the powers that be – NHL ownership. Outspoken against the owners raking in many millions, while he and other greats like Gordie Howe, Ted Lindsay, Andy Bathgate, and others remained severely underpaid, he soon ostracized himself from Montreal ownership. As a means of punishment, the Canadiens shipped Harvey to the lowly New York Rangers in exchange for the pugilistic Lou Fontinato. 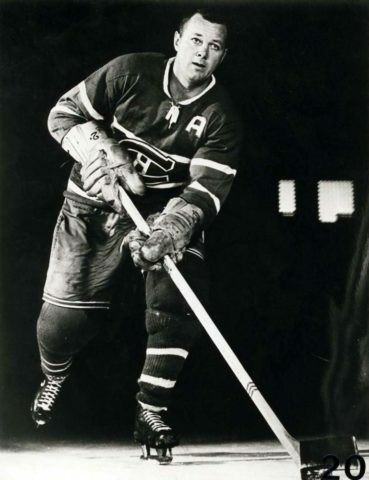 The move readily backfired on Montreal, as Harvey would go on to win the seventh Norris Trophy of his career in his first season with New York. He would also be named a First Team All-Star yet again, and played in the 1962 NHL All-Star Game. Oddly enough, during his first season with the Rangers Harvey was utilized as a player-coach. Not finding it to his liking, he would step out of that role the following year. Harvey would have an even better year with the “Blueshirts” during the 1962-63 season when he put forth four goals and 35 assists for 39 points in 68 games. Rather surprising to consider that he did not earn another Norris, nor any All-Star nods that year. At this point Harvey was 38 years old, finished fourth on the Rangers in points and led the entire league in scoring among defensemen. Despite such a successful second season in New York, his time there would not last much longer. Feeling that he was well beyond his prime, the Rangers failed to protect Harvey during the 1963 intra-league draft. While he would play 14 games with the Rangers during the 1963-64 season, he toiled in the minors from then on up through most of the 1967-68 season. Harvey would have a brief two-game stint with the Detroit Red Wings during the 1966-67 season, but otherwise his NHL career was essentially over. Or so it was thought. In 1967 the NHL decided to expand from six teams to an even dozen. Joining the “Original Six” franchises came six new colorful teams – the Los Angeles Kings, Pittsburgh Penguins, Philadelphia Flyers, Oakland Seals, Minnesota North Stars, and the St. Louis Blues. An expansion draft was held, and the six new teams could select players from the already established half dozen. The one team to earn immediate success was St. Louis. With first year NHL head coach Scotty Bowman at the helm – soon to be on his way to becoming the greatest coach of all-time – the team was a grand collection of hockey’s “golden oldies”. Stanley Cup champions Red Berenson, Al Arbour, Glenn Hall, Dickie Moore, Jimmy Roberts, and Jean-Guy Talbot all suited up for the team during the 1967-68 season. By the time the playoffs rolled around that Spring, Harvey would join them. Love this cover of St Louis Blues program. The Blues would make it all the way to the Stanley Cup Final that first year. While they were a part of the all-expansion Western Conference where one of the new teams was guaranteed a trip to the Final, the Blues were heads above the rest when compared to the other five teams in terms of talent (although only six points separated the first place Flyers from the fifth Penguins, while St. Louis finished third overall in the conference that year with a record of 27-31-16). Harvey had been serving as a player-coach for the Blues’ minor league affiliate, the AHL’s Kansas City Blues. After Harvey’s Blues were eliminated from the AHL playoffs, the parent club would call he and a few other players up for their run at the Stanley Cup. Basically, Bowman needed him to be a steadying presence on his blue line and knew the aged defender would not let him down. Harvey would play in eight of the Blues 18 playoff games and had four assists in the process. Two of his eight games were played in the Final, where he picked up one of his assists. Unfortunately, St. Louis would be swept in four straight games by the powerhouse Canadiens, but scrapped enough to at least push Games One and Three into overtime. After 21 years of professional hockey, Harvey would play his 22nd and final season in 1968-69 with St. Louis. He would play the entire regular season with the team, and seemed to shed off 15 to 20 years of age as he played. Harvey would begin the year as a 43-year-old defender, and would turn 44 in just the third month of the season (he was born Dec. 19th, 1924). Even at that age, he played in 70 of 76 games, scored a pair of goals and added 20 assists. Not surprisingly, Harvey would be selected to play in his 13th All-Star Game that January and earned an assist in the game. The Blues of the 1968-69 season continued their superb play under Bowman’s coaching. In addition to Harvey, Hall, Talbot, Berenson, and Arbour, the Blues would add some further veteran seasoning in the likes of Camille Henry, Ab McDonald, and the great Jacques Plante. Having the goaltending duo of Plante and Hall earned the Hall of Fame tandem the Vezina Trophy, as they combined for 13 shutouts that year. Interestingly enough, this was the third time in Harvey’s NHL career that he and Plante were teammates. The two started together with the Canadiens, then were teammates briefly with the Rangers, only to have Harvey helping to clear Plante’s crease yet again in St. Louis. With Plante and Hall anchoring the team in net, and Harvey, Talbot, Arbour and the Plagers – Barclay and Bob – on their back end, the Blues possessed what was possibly the most stalwart defense in the NHL at the time. Oct. 12, 1968: The Blues second game of the season. In a 6-0 drubbing of the Los Angeles Kings and their goaltender Wayne Rutledge, Harvey picked up his first assists of the season. He grabbed the lone assist on the first goal of the game – a power play tally by Red Berenson at 6:11 of the opening period. Then in the third Harvey earned a secondary assist on Ab McDonald’s second of the game, with the primary assist going to Bob Plager. Oct. 24, 1968: Out-dueling Bobby Orr, who scored the game’s first goal, Harvey orchestrated a Blues 2-1 win over the Boston Bruins. Gaining the secondary assist on third period goals from Gary Sabourin and McDonald, Harvey was the only multi-point player of the game. Glenn Hall steered aside 27 of the 28 shots that St. Louis faced. Oct. 30, 1968: Harvey would have yet another two-point night for the Blues, and actually opened the scoring himself. As St. Louis faced Bernie Parent and the Philadelphia Flyers, Harvey scored the first goal of the game – a power play goal from Jim Roberts and Berenson just under three minutes into the game. Late in the third period he would set up Berenson with just over two minutes remaining for Harvey’s second point of the night. Not bad for a 43-year-old who was soon to turn 44. Nov. 30, 1968: As Hall stopped all 28 shots that the Flyers sent the Blues’ way, Harvey set up Berenson for the lone goal of the game. Just 44 seconds into the second period, Berenson would beat Parent off of Harvey’s feed. While Hall got the shutout for the Blues, Parent turned aside 40 of the 41 shots he faced, with only Berenson’s shot eluding him. Dec. 4, 1968: The Blues entered into the third period behind 3-1 to the Chicago Blackhawks, fueled behind two assists from “The Golden Jet” Bobby Hull. As the final frame ensued, Harvey helped mount the comeback for St. Louis. Both Camille Henry and Harvey set up McDonald’s power play goal at 11:03. Just over a minute later, Harvey would get his second assist of the night to tie the game on a goal by Sabourin. Frank St. Marseille picked up the primary assist on the goal. The game would end in a 3-3 tie, with Harvey making certain it would not be a Blues’ loss. Jan. 3, 1969: Less than a month after his 44th birthday Harvey would score the final goal of his NHL career. On the road against the Seals at the Oakland-Alameda County Coliseum Arena, the Blues would come away with a 3-1 win. Harvey scored the first goal of the game with assists to Bill McCreary and Ron Schock. Beating Seals goalie Gary Smith just 1:19 into the game to score for the final time. Jan. 11, 1969: The Blues rolled to a 6-1 victory over the Blackhawks. As St. Louis goaltender Jacques Plante stopped 28 of 29 shots, Harvey helped set up two of the three goals the Blues scored in the first period. McCreary scored the first goal of the game from Schock and Harvey just 47 seconds after the game began. Schock would then score two straight goals of his own at 2:07 and 11:51, with McCreary getting assists on both goals and with a secondary helper going to Harvey on the second of the two tallies. Feb. 12, 1969: You knew that Harvey would have to be a factor at least somewhere in the stats column in this Blues 2-0 win over the Pittsburgh Penguins. The Hall of Fame defender had his highest shot total of the season as he put four on net against goaltender Joe Daley. As Hall earned the shutout by making 32 stops, Berenson and Harvey assisted on the first score of the game, a goal by Henry. Mar. 13, 1969: In one of the most exciting games of the 1968-69 season, St. Louis battled the Detroit Red Wings to earn a 3-2 victory. Some of hockey’s all-time greats stood out in this contest. Gordie Howe assisted on both Red Wings goals, including a power play goal from Alex Delvecchio in the opening period. Blues goaltender Plante made 39 saves on 41 shots. Harvey would earn the primary assist on St. Louis’ second goal of the game scored by Berenson. This would be the final NHL point of Harvey’s storied NHL career. As the 1968-69 regular season came to a conclusion, Harvey decided to retire. His final NHL game was played Mar. 29, 1969 in Los Angeles against the Kings. Harvey would be a plus-one on the night. He would not play in any of the team’s postseason games that year, even though the Blues easily captured the Western Conference. The Blues – albeit without Harvey – would make a return trip to the Stanley Cup Final that same year. Unfortunately, they would be swept by Montreal yet again. This time around it was not a particularly close series either. The Blues managed to score only three goals in the entire four games, while allowing Montreal to score 12. It would be absurd to think that had he played in the series, Harvey wouldn’t have had an impact. At the very least, the goal differential would have been closer. While Harvey received unanimous induction into the Hockey Hall of Fame in 1973, his jersey was never retired by the Montreal Canadiens until 1985. This stemmed solely from old grudges from Harvey’s involvement in organizing a players’ union. It is more than sad that so much time elapsed before the big defender was rightfully honored – it was a shame. However, his jersey did eventually make it to the rafters where it long deserved to be housed. Most sadly, we lost Doug Harvey way too early in life. The man who is arguably the greatest defenseman to ever play passed away from cirrhosis of the liver in 1989 at the age of 65 – on the day after Christmas and only a week after his birthday. One has to wonder if more contemporary defense stars like Lidstrom, P.K. Subban, Zdeno Chara, or Erik Karlsson know of Doug Harvey. Hopefully, they know quite a bit, or otherwise they are missing out. One would think that Scotty Bowman, Red Berenson, the late-Al Arbour, and plenty more would vouch for what Harvey meant to the game of hockey and their respective careers. Perhaps the easiest way to sum it up is this: at 44 years old, a seven-time Norris Trophy winner played 70 games for an expansion team, and guided them to a first place finish – and he did so for the love of the game. That in and of itself is what makes Doug Harvey’s 1968-69 NHL season one for the ages.